A help wanted sign on the door of a gas station in Encinitas, Calif. Hiring soared in April as the US economy created the most jobs in two years, another sign the plodding recovery is finally shaking off the last recession and accelerating toward a stronger expansion. Employers added 288,000 jobs last month, spread across industries from construction to retail to health care to professional services, the Labor Department reported Friday. The unemployment rate fell nearly a half-point, to 6.3 percent, the lowest since Sept. 2008. The jobs report follows other positive economic reports. Consumer confidence is near a six-year high, business spending on equipment is increasing, and home prices are on the rise. The strongest growth in hiring nationally came from companies that provide technology, accounting, and other business services, a particularly important sector in the Massachusetts economy. Another of the state’s key sectors, health care and education, also experienced strong job gains nationally. The state will release employment statistics for April in about two weeks, but hiring in Massachusetts has also shown signs of picking up. Last month, employers in the state added more than 8,000 jobs, pushing overall employment to an all-time high of about 3.4 million jobs. 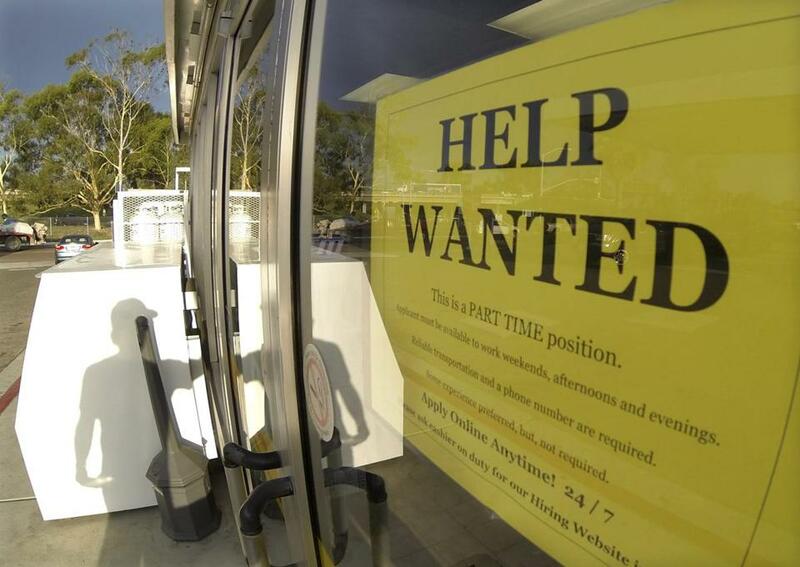 Kip Hollister, founder of the Boston staffing firm Hollister, Inc., said she is seeing signs that the job market is improving for workers in Massachusetts. Companies that not too long ago were mostly hiring temporary or contract workers are now seeking permanent employees; the demand for workers to fill permanents positions is up about 8 percent from a year ago at her business, Hollister said. At the same time, employers are starting to find that if they delay too long in making offers to candidates, they may lose those prospects to competitors. “It does show that the times are changing,” Hollister said. The nation has added more than 200,000 jobs in each of the past three months, and has regained all the private sector jobs lost in the last recession. The national jobless rate has dropped more than a percentage point in the last year. But analysts said optimism about the economy should still be tempered. It will likely take another two years to reach the 5.5 percent rate considered full employment. Average hourly earnings were flat in April and only up by 1.9 percent over the year, barely keeping up with inflation. In addition, much of last month’s decline in the unemployment rate was the result of more than 800,000 workers giving up work searches and dropping out of the labor force. Only those who seek work are counted by the Labor Department as unemployed. Some economists attributed the drop in labor force participation to the expiration of long-term unemployment benefits, which may have removed an incentive for some to continue job searches. Unemployed workers must actively seek work to receive benefits. There are “people in 30s and 40s who normally should be working are not working,” said Maury N. Harris, an economist with UBS Securities in New York. But overall, the economy looks to be back on track, said Doug Handler, chief US economist IHS Global Insight, a Lexington forecasting firm. The Federal Reserve’s decision to continue to pare back stimulus measures indicates the policy makers have underlying confidence that the economy is strengthening, Handler said. The central bank last week said it would reduce its monthly bond buying program, created to hold down long-term interest rates down and spur investment and hiring, by another $10 billion to $45 billion. Policy makers, however, have signaled they will move slowly in withdrawing from the economy and hold the Fed’s key short-term rate near zero for some time.